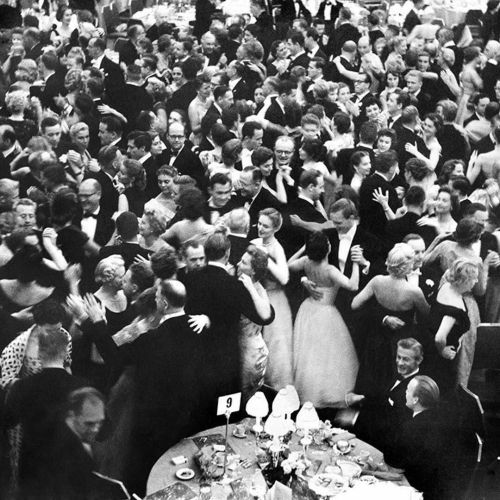 ""Elegance en masse in the great tradition of the Waldorf-Astoria," read a September 1956 @nytimes caption alongside this photo, which was taken in the @waldorfnyc's Grand Ballroom during a dinner-dance for the Royal Danish Ballet. The festivities took place the day after the ballet company made its first appearance in America in a performance at the @MetOpera House. "The Danish ballet, from its impish 'ballet children' to its mature character dancers, is pretty thoroughly irresistible," @nytimes reported that week. "Its people are handsome, its dancing is expert, and its artistry is unimpeachable." Photo by @nytimes staff photographer Sam Falk. #tbt" By nytimes on Instagram.